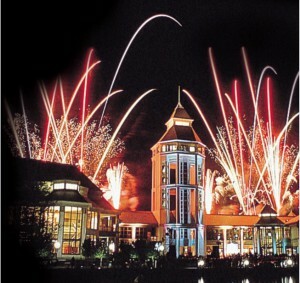 World Golf Village Fireworks are Back on July 3rd! It’s that time of year again when World Golf Village puts on one of the largest and most anticipated fireworks show in Florida! Come out and celebrate Independence Day on Monday, July 3rd in the Village to enjoy the breathtaking fireworks display over Kelly Lake. Fireworks are set to go off at 9:30 pm! Attendees can enjoy food from local restaurants, including Murray Bros. CaddyShack, The World Golf Hall of Fame Café (open from noon until 9 pm) or make reservations for the Renaissance at World Golf Village’s Red, White & Boom Buffet. Your ticket includes the dinner buffet, open bar, parking pass, live entertainment and prime seating for the fireworks show. Call (904) 940-8696 for more info! No tickets are necessary for the fireworks, however parking costs $10 per vehicle. No coolers or pets allowed. Food and beverages will be on sale throughout the grounds. There will be games for the kids and a live DJ providing entertainment during the show. Make sure to bring blankets, chairs, and bug spray! Happy Independence Day!